“Saving money on things that aren’t important to you so you can spend them on things that are important is, in my mind, the cornerstone of frugality. Ah-hah! She gets it. 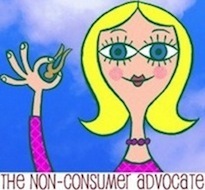 The Non-Consumer life is not about across the board deprivation. It’s about being deliberate with expenditures. Save money on the meaningless stuff so money is available for the experiences that really float your boat. People are often self conscious around me when talking about anything they bought, or did that’s expensive. I am not actually judgmental about how people spend their money. Everyone lives a different life with different values. That’s how it should be. The problem lies when people are spending so much money on the little stuff, that there’s nothing leftover for the meaningful. So go ahead people, tell me about your fancy cars and swimming pools. If that’s what’s important to you, great. Just save your tales of countless hundreds spent on lattes and lunches out. That’s why you live paycheck-to-paycheck, and will never go on a foreign adventure. My husband and I have always led a modest life despite what all our friends were doing. We hated debt and worked really hard to eliminate it completely from our life. It took years but we are finally down to only a mortgage. We did it using just this strategy you speak of. We have always tried to save where we can, using all our resources like coupons, the library, eating in, using what already exists in our home and taking hand me downs that are usable and making them work. Because we have lived this way, we have a savings. Many people we know do not. We have never felt the least bit deprived because if we really want something, we get it. We just shop around for the best deal possible, do our research, then buy quality, ‘middle’ products. For example, I have a totally loaded out Mazda, but not a Mercedes. I feel really cool with that. The last couple of posts have been awesome, and I just have to comment. People tend to think of being frugal as completely doing without. (It isn’t, that is just being cheap, and there is a difference.) I can’t even begin to tell you the thrill when my seventeen year old daughter announced a couple of weeks ago that she is going to live poor so that she can travel. All those years of explaining the tradeoffs we have made is paying off! As you say, Katy, it is about making the choices. We have always lived somewhat frugally, but never to the point of denying ourselves the things we like completely. We live, comfortably, on about half the income many of our friends find it a struggle to live on. I try very hard to impart how we do this to our son. When we left home we were broke. We paid the bills and bought food on payday, and if there was anything left then we talked about what we could do with it. We still live that way. Too many of our friends buy what they want on payday, then look at the bills and grocery shopping, and don’t have enough money left. Thank you for your thought-provoking posts! You are helping me define what I believe frugality is for my family. Do you think that there are some people whose boats might be made to float by lattes? I think it’s possible that some people really do love those kinds of things, you know? I personally hate to spend my money on stuff like that(I like to have things that last! ), but if this is all about doing what floats your boat, then lattes and lunches out could be as important as a vacation. Are the skull and crossbones floating in the latte intentional? Do you see them? Kind of like a warning, an ominous portent floating in your $5 Starbucks joe. 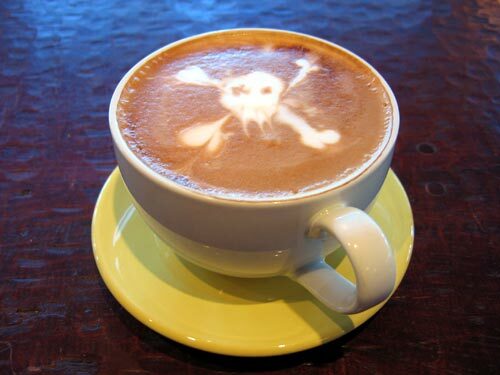 Are a skull and crossbones in your latte ever non-intentional? I’m sure many frugal choices seem odd to others, but we do what we do so we can enjoy what we enjoy. On more than one occasion I have been chastised outside our local thrift shop by another who spied my obscenely large truck. It is absolutely neccesary for my chosen work, it’s the smallest truck that can do the job, it gets the best fuel economy of it’s class, it should go 300,000 miles (not kind ones, either), and yes, it was expensive. So I shouldn’t be able to buy second hand at the thrift store? Snap judgements do annoy me! Next post: S-T-A-Y-C-A-T-I-O-N, In The Summertime!